Floor Locks offer a foot activated braking option for equipment and carts to be used in conjunction with casters of similar heights. When retracted, the casters and the cart they are attached to, can roll freely; however once the spring loaded pedal is depressed, the floor lock base with rubber pad is extended to create forceful resistance with the floor to immobilize the equipment. Please note that Floor locks are not designed to be a jack, and do not lift or directly support weight. 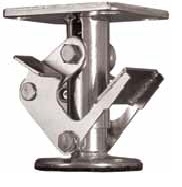 Caster Over Height : 5-5/8"